The Otaki Mail has become aware of dangerous, irresponsible driving on Otaki Beach. There has always been a tension between the common belief that the beach is a road and therefore can be driven on, and the belief that the beach is a playground for walkers — with or without dogs, for swimmers, and families to enjoy nature at its best. Both perceptions are right but there are ways to manage the tension, and Council has By-laws aimed at achieving that. If you see vehicles being driven on the beach in an irresponsible way and have a cell phone, we suggest you take a photo of the vehicle’s licence plate and if possible the driver — as long as doing this does not put you at risk. Police ask you to take note of licence plates then call the Police IMMEDIATELY on 111. Don’t delay. Phone the police immediately and they will act. Police will prosecute these offenders. Please don’t put yourself in danger. Reckless behaviour does always cause harm, whether it is to the little dog run down by a bike recently, or to children running around innocently playing, or the elderly walking peacefully along a beach, where everybody has a right to go. It also harms the natural environment. The effect on sensitive dunes, valiantly replanted time and time again by the Waitohu Stream care group, to protect the dunes from erosion can be very damaging. This planting is critical protection to both public and private land and we should all appreciate and respect it. There are rules for driving vehicles on beaches all with the safety of people and property in mind. Two wheeled road or off-road motorbikes are not permitted on the beach. 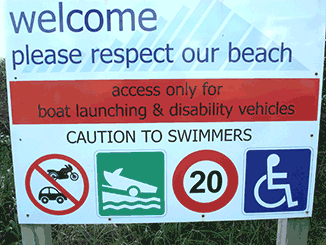 Vehicles are only permitted to access beaches to launch boats. Any vehicle must have a current warrant and be registered. Vehicles must access the beach via an authorised beach access, be parked in such a way to avoid blocking access for other beach users, be driven in a safe and careful manner at no more than 20 km/hr, not be repeatedly driven back and forth over the same stretch of wet sand causing potential damage to shellfish beds, and not be driven onto fragile dune areas containing breeding birds and erosion-control plants. Check the KCDC website for areas where vehicles can be driven. Otaki beach is our taonga. Please look after it.